Towle School #6 built 1858 – Knowles School #8 – These two schools share their history. You will have to follow closely to understand their complex relationship. 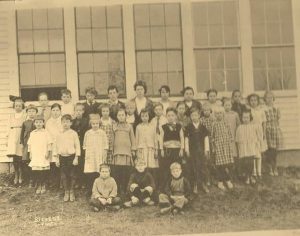 Towle School was located on the corner of Fremont and Towle Roads. It was town property but built on land owned by the Towle family. It burned in November of 1968. 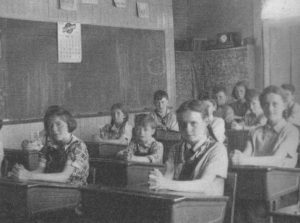 Knowles school was located on Raymond Road a short distance before the Rod and Gun Club. With a change in enrollment it was necessary to redistrict. The Towle family ran a boarding house at the farm and welcomed the chance to buy the Towle school building from the town. It was then decided to move the Knowles School to a more central location. 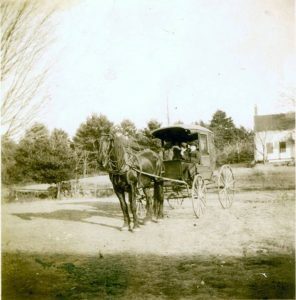 Working with a turnstile on December 6, 1920, three percheron horses moved it to its present location on Towle Road. Emma Lane and friends gathered at church homes to watch the activity. A holiday spirit prevailed. Why the Knowles building was renamed the Towle School is unclear. Possibly there were more Towle’s than Knowles attending. Muriel Church tells of fun times sliding with the children when she taught at Towle school. Recess allowed enough time for one slide down the big hill and across the open field. This was written by Evelyn Noyes and Gladys Nicoll.